But then who wouldn't be high on themselves with that lineage? 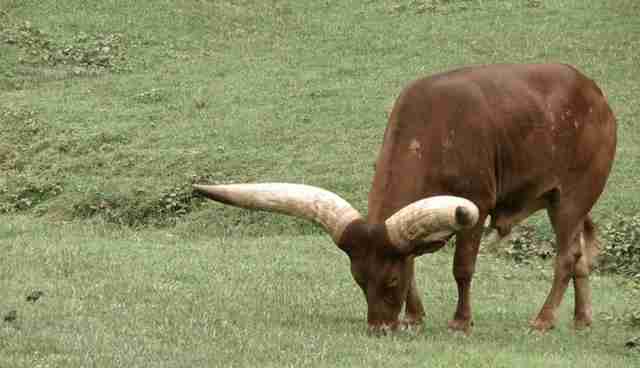 Not to mention their stunning good looks: They sport horns that resemble a matched set of Brancusi's "Bird in Space," only bent -- a rack that makes the bodacious antennae on Texas Longhorns look wimpy by comparison. What must it do to your head to grow those damn things, and to your neck to hold them up all day? 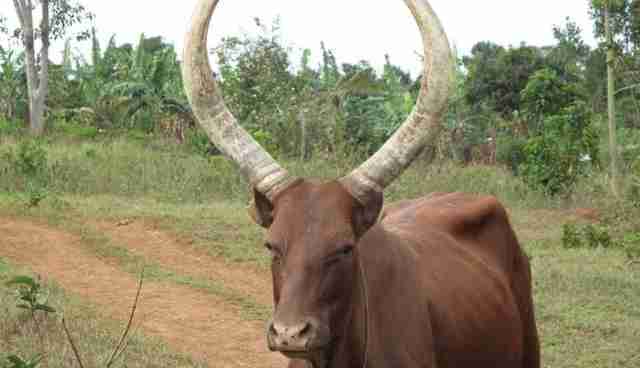 From the shoulders forward the Ankole are the one plus ultra of bovine structural engineering. In the other direction they're, well, cows. One of my deep pleasures the first 10 weeks I was in Uganda was sitting on the front porch of the family home where I was staying and watching the fashion parade of humans and animals at the end of the day. It was visually delicious, funny, poignant, amazing, shocking -- sometimes all of that at once. Here comes a woman wearing a long black dress and a bright red head wrap, the end of which tumbles down her back. On her chest is an oversize white cross that appears to be made of ivory. On her shoulder, she's carrying a large, cylindrical grinding bowl made of wood, with the pestle balanced inside. She's followed by a boy urging six cows down the road while talking on his cellphone. He has a jackfruit on his head. A linen merchant is also doing a balancing act, but he's holding an 18-inch-high stack of his neatly folded merchandise -- sheets with a floral print. A man has a pole resting across his shoulders hung with bras of various sizes and colors. He's selling them door to door. A woman is holding a large chunk of pineapple wrapped in a banana leaf (Ugandan pineapple is 10 times sweeter and juicier than any other). There's a machete balanced on her head. Another woman passes -- she's Muslim -- wearing a white calf-length gown with white satin pants underneath, a black shawl over her shoulders, and a white turban-like head wrap. Flocks of children go by intermittently and yell to me: "Hi, muzungu!" or "See you!" Miscellaneous cows, goats and chickens wander aimlessly, nonplussed by the human splendor around them, window shopping for snacks that strike their fancy. 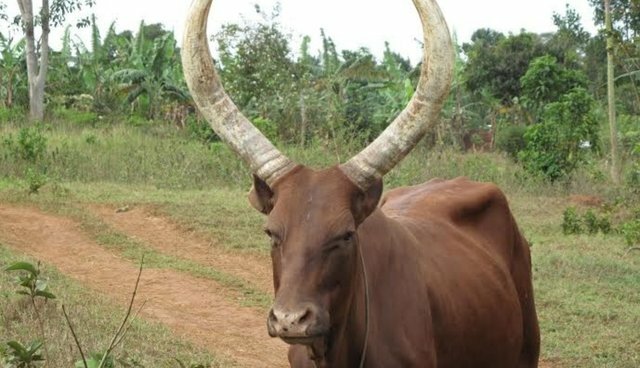 Speaking of which, my favorite parade participants were four of my neighbors who happened to be Ankole cattle -- two calves and their moms. They lived across the street in a small paddock. That's where they spent their nights anyway. Every morning, the local herdsmen would come collect the four and steer them to prime grazing land outside the village. Apparently, he provided this service -- like a Manhattan dog walker -- to several households. The foursome knew the drill: As soon as he let them out of their enclosure in the morning, they trotted cheerfully off to breakfast, herdsman running alongside. But dusk was when I set my watch by them. As I sat on the porch taking in the endlessly surprising procession, the two cows and two calves would come strolling down the road, single file, unaccompanied, knowing exactly where they were headed, always punctual, walk under the laundry line and between two adobe buildings, and through the gate of the paddock the four of them could just barely fit into -- to wait patiently as the moon rose and set, and the sun slipped up over the horizon and made it morning, so they could follow their herdsman and their happy routine one more time.